Inpatient drug rehab is a great option for many people trying to get sober. As inpatient programs provide a controlled environment, the temptations of daily life are not present, and it is easier for the individual to recover and heal. Leaving the inpatient facility, though, comes with many of its own challenges, including returning to that life, complete with many of the places and people that facilitated your addiction. Here are some tips to help with fighting temptation after leaving an inpatient rehab facility. 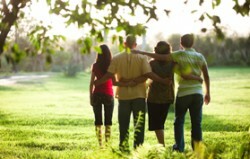 Ensuring that you carefully choose your relationships can help you in recovery. Is this person going to be pleased that you are living a better, sober life? Is this person going to aid you in your recovery? Was this person involved in your drug abuse (a dealer, a friend you did drugs with)? Do you trust this person to have your best interests at heart? These questions are important ones to ask yourself when leaving rehab and examining your relationships. Sometimes, you will need to remove people from your current social circle in order to make sure you are not reminded of old habits. Surround yourself with people you trust and people who want to see you recover. If you had drugs or drug paraphernalia in your home before you left for rehab, ask someone you trust to remove these things before you return. Also, if your daily routine included going places where you would be tempted to do drugs, make sure you modify it so that you don’t have to go to those places anymore. This will go a long way in helping you: if you’re not around drugs and places where drugs are used and kept, it will help you not to think about them as much. According to the National Institute on Drug Abuse, “outpatient behavioral treatment encompasses a wide variety of programs for patients who visit a clinic at regular intervals.” Outpatient treatment is a great way to continue the therapy and skills you used in the inpatient program while also getting to live your life. Many people feel that outpatient programs keep them on track and help them remember that recovery is an ongoing process. When you feel tempted, it’s a good idea to visit your local outpatient facility to discuss your feelings with other people working on their own recoveries. You can ask about outpatient programs while still in rehab or use the SAMHSA website to find an outpatient program that works for you. For different people addicted to different substances, there are always many temptations after leaving inpatient rehab. But the important thing is to try and neutralize the ones you can before leaving the program and to recognize the ones that catch you off guard. Then it will be easier to continue following your own path to recovery. Help! I Can’t Afford Rehab - Health insurance coverage, payment plans, free programs, and support groups are all helpful resources for those who feel they can't afford rehab. How PTSD and Addiction Are Treated at Inpatient Drug Rehab Centers - Learn about how inpatient drug rehab centers treat PTSD and other co-occurring mental disorders.